Do You Have What It Takes to Be a SUPERStar Foster Family? Read more about Do You Have What It Takes to Be a SUPERStar Foster Family? Wow You Guys are ROCK STARS Together we raised over 9,102. There are no words to express how grateful we are to everyone who donated and even shared and got our word out. We are one of the smallest groups who participate in NTGiving Day and I worried that we wouldn't get noticed with so many other awesome groups..
Thursday, Sept 22nd from 6am to midnight. #NTXGivingDay is your chance to have your donation do more as every donation of 25 or more is eligible for a percentage of matching funds. 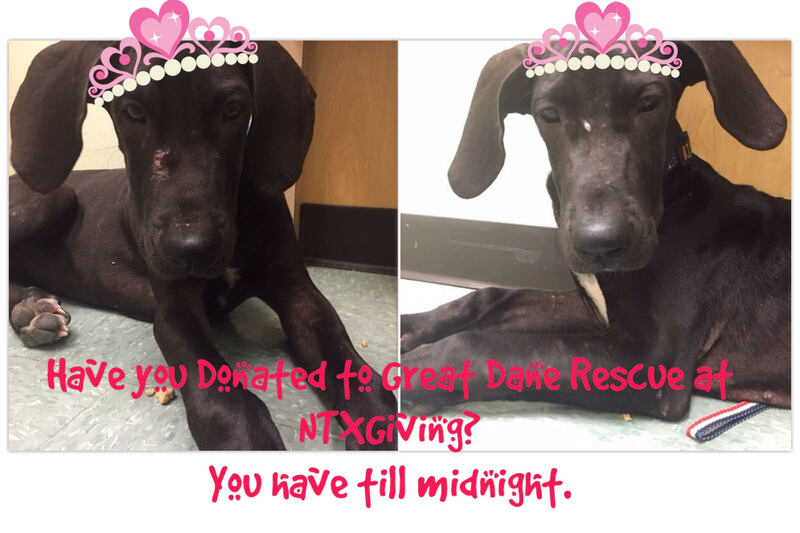 This is a huge fundraiser for us and helps us pay for veterinary expenses for our danes... Remember we are all volunteer and all privately funded.... Without your financial support we can no exist. My Dane turns 4 today! While that may not seem like a big deal on the surface, it is a big deal when you know that she never would have made it past six months without GDRNT. Every birthday, I get her a special treat, make her wear a silly party hat, and take cute photos to celebrate another year. I do these things to commemorate the hard work and partnership of GDRNT and the shelter that placed her in their care. Plus, she loves the treats and attention! Thursday, Sept 22nd from 6am to midnight. #NTXGivingDay is your chance to have your donation do more as every donation of 25 or more is eligable for a percentage of matching funds. This is a huge fundraiser for us and helps us pay for veterinary expensies for our danes... Remember we are all vounteer and all privately funded.... Without your financial support. Click here for a direct link to GDRNT for #NTXGivingDay. LOOK, just LOOK at these sweet faces. Do you see the love? The smile on their face? For probably the first time in their lives each of these GDRNT sweet foster pups finally knew what it meant to have a full bowl, a soft bed, kind hands and a loving home. Each came to us from a shelter who knew we could do more for these pups than they could... knew we were their best shot. Like all our foster dogs they received exemplary veterinary care, necessary medication/procedures, quality nutrition, and benefits of a loving foster home. They discovered the wonders of air conditioning, cool evening strolls, full bellies, ear scratches, tummy rubs, kissy voices and peaceful slumber. But it wasn't enough. It just flipping wasn't enough. While we could restore their spirit, we could not restore their health. Over the last several months Rain, Harvey and Lulu came to us heavy with the burden of their painful past, and in spite of our best efforts the hard decision, the right decision, was made by our board, for Rain, Harvey and Lulu to be released from their suffering and allow them to cross the rainbow bridge. These are not decisions our board takes lightly. We consult with our amazing veterinary team, take input from our foster family and ultimately make the best decision for a dog who has lost their quality of life, with no chance of making them well... no matter how much we want too. This is when rescue is hard... when hard decisions are the right decisions and that decision falls to us. Why do I tell you this now? I have always wanted this page to be positive to focus on all the good in rescue, to try to educate people about our group and dane ownership. GDRNT is an all volunteer, foster home based rescue. Since 2001 we have worked with area shelters to pull those who need us most. Not the ones with the most pledges/donations, with the saddest family FB story, found by well intended or that can be "adopted fast"... while I do not fault those groups who do. Our focus is those danes in area shelters most at risk of not making it out, for whatever reasons. We only commit to a dog knowing we have the foster space and funding in place to help. We do great things and I want that to be the focus. Soooo why do I tell you this now? This one day online fundraiser provides a percentage of matching funds for every 25 or greater donation made via their website. Making your donation go FURther. 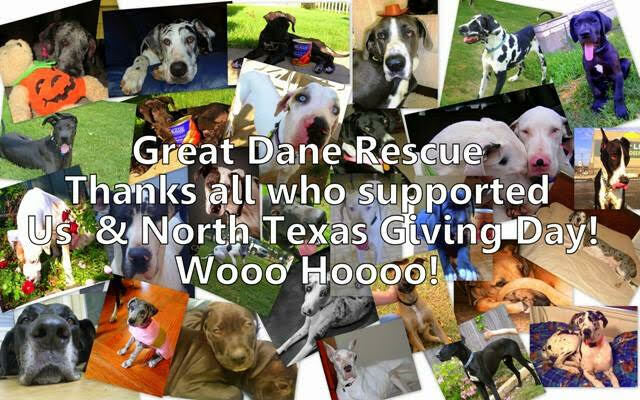 You do not need to be in North Texas to donate..just have an internet connection and giving heart... the Heart of a Dane. We see it too often. Have you thought about it? What arrangements have you made for your pets should you out live them? What if you are incapacitated indefinitely? Where will they go? Who will care for them? We have pulled 8 dogs in 8 days, 7 are Heartworm postitive, 5 of those have multiple issues on top of the heartworms..... but what is hard to understand is that heartworms are largely preventable. Monthly prevention, acquired from your veterinarian, can be very effective in protecting your pet. Especially in comparison to the treatment once they are positive. Please check with your veterinarian to make sure your pet is covered. 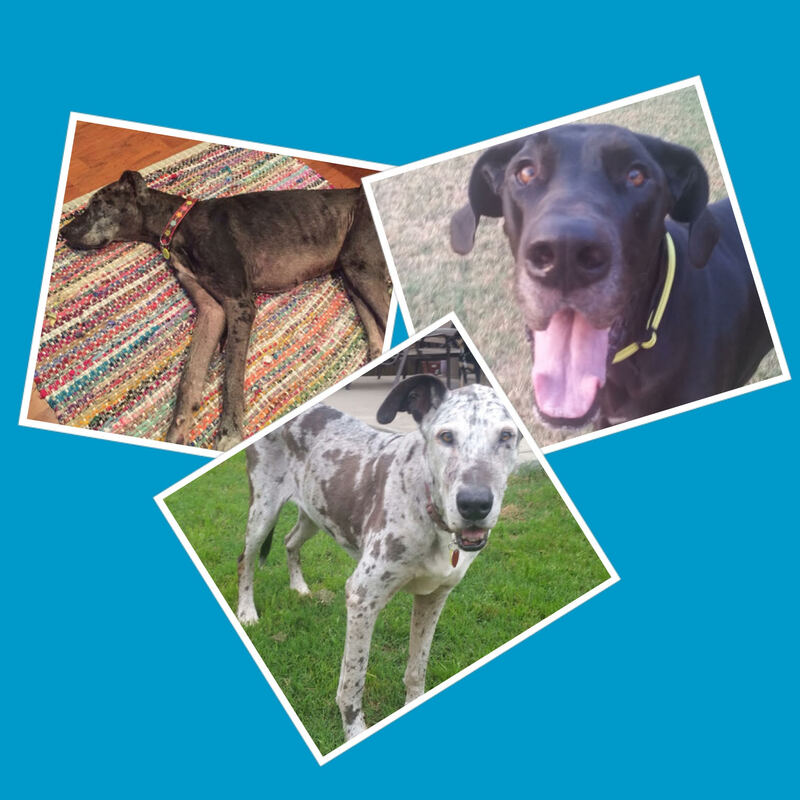 Join us at Three Dog Bakery in Plano from 10 to noon on Saturday, July 16th to meet some of our fosters, personal Danes, and volunteers, and learn more about our rescue. While you're there, pick up some tasty treats for your pups! Please note that we do not do on the spot adoptions at Meet & Greet events. When the box arrived I was truly overwhelmed. So a Great Dane size THANK YOU to 1-800-PetMeds Cares for their support.